My Dad, James Needham Groom was born 2-1/2 miles south of Bailey, Texas on June 25, 1911. In 1992, Dad had a stroke which left him partially paralyzed and without the ability to talk. It seems so ironic - Dad loved to talk and was always the life of our family gatherings, telling story after story with such a great sense of humor. I can hear his low pitched, booming voice now, with dear Aunt Loma�s melodious laughter filling the room throughout all of his antidotes. What great memories those are! 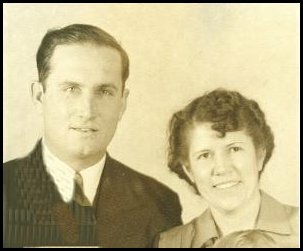 In the early 1940�s Dad met and married my mother, Wilma Mira Moore, in Indiana. Dad said if it hadn�t been for her and the stability she brought into his life, he�d been dead long ago. My Dad�s job as a pipe fitter (construction worker) took him, my mother and us kids to places all over the United States and several foreign countries to live. Dad was and is a very intelligent, complex person - demanding, understanding, tolerant, intolerant, kind, hard, loving and not so loving, self-centered and generous. During the six years when he and mother were in my care, I saw another side of Dad - sweet and sensitive. Dad�s life was a struggle when he was growing up and he always made sure he provided for us and gave us what he never had - a home, a Mother who could be there for us, and plenty to eat. I never remember a time that he stayed home from work - He must have been sick at times, but he never did miss work. I didn�t know how to appreciate these things until I became an adult with all the responsibilities of working and raising children. And still, I only have a small understanding of it, since he grew up in much harder times and circumstances than I can ever imagine. And I�m pleased that this entire section is not completely in my hands to try to tell you about my Dad. Luckily, I found several of his writings which I�m thrilled to include here.